My partner and I have been salon owners for 19 years, and we’ve finally wizened up and have been working on our salon policy, guidelines, and procedures. There seems to be so much to get through; I’m afraid there will be an instance where we either wrote it incorrectly or didn’t cover it. Our policy will end up having many amendments, which might make us lose all creditability. This is the toughest part of being a salon owner — trying to cover your backside without cutting your salon culture to shreds. We appreciate any suggestions or comments in our current predicament. I understand your concern; putting together policies and procedures can be a challenge. I’m fortunate to come from a corporate background that not only gives me insight to the legal needs but, having spent 25 years in the salon industry, I have a lot of good info to draw from. The technicians at Rob|b are employees, so our policies and procedures (employee handbook) needed to be spelled out for that situation. 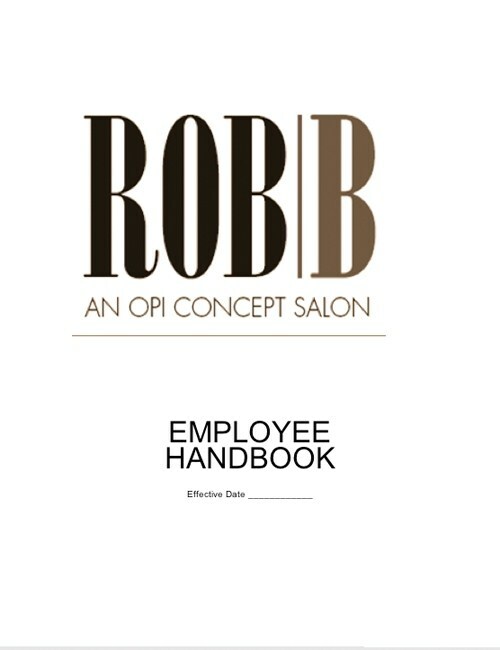 Being an OPI concept salon means we will only use OPI product for services so I have OPI’s educational information to draw from for service procedures manual. I don’t know what product lines your salon uses, but all major manufactures have educational guidelines that can be used for service procedures. The Internet is also a great source of information on writing any manual. Just Google the info you’re looking for and sort through what you find. For a small fee or even sometimes for free, you can find templates for just about anything. Then you just need to adapt them to your needs. I know this looks pretty involved, but I want to make sure we’ve covered all our bases. I hope this is helpful to you. If you have any further questions I’ll do my best to help. Thanks for reading our blog and I hope you stay updated on our progress.